You are here: Home / Wine for Wisdom – The Mediterranean! Wine for Wisdom – The Mediterranean! This event is SOLD OUT – to be added to the waiting list, please contact Kristie Tapley at 863.297.1071. 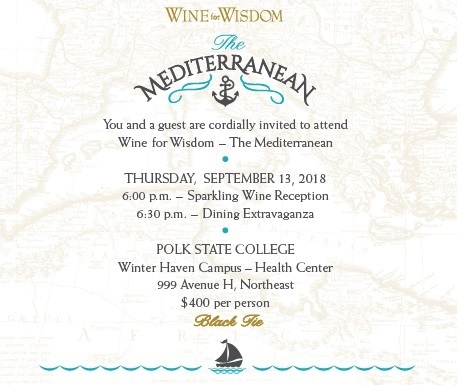 On September 13, 2018, the Polk State College Foundation’s signature event – Wine for Wisdom – will continue the World Tour to The Mediterranean! For one sumptuous evening, enjoy an elegantly full-bodied experience, every moment inspired by culture, cuisine and vintages of the land where turquoise waters lap gently against panoramic, sun-warmed shores. This highly anticipated event raises money to benefit student scholarships. The Boyer Building Corporation will once again be the presenting sponsor for this incredible dining experience. The night will be carefully sculpted by a master chef and sommelier, who will both pair items to maximize the savory pleasures enjoyed by all. Sure to be a sellout once again, this event will be held on September 13 in the Health Center on the Winter Haven Campus. For more information regarding sponsorship information, please contact the Polk State College Foundation at 863.297.1071 or email Kristie Tapley at ktapley@polk.edu. Wine for Wisdom - The Mediterranean!